That’s how I feel this morning — my head feels like a bunch of scattered pictures lying on my bedroom floor. 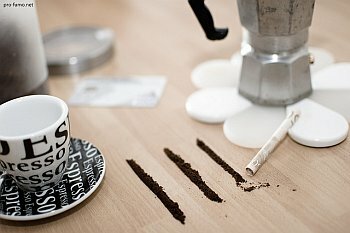 Can’t tell how much of this sensation is work hangover from a too-busy weekend, or a result of a themeless news morning. Often as I browse my feeds I find narratives emerge on their own, bubbling up on their own. Today? Not so much. There are too many topics in flight, too many major stories juggled, too many balls in the air, everything’s a blur. U.S. primary season wrap-up and the general election ahead — and I’m not going to touch this topic with a 20-foot pole. Imma’ let better writers and statisticians handle it without me piling on. The Philippines election — the leading candidate is alleged to encourage urban vigilante death squads to reduce crime. Brexit — Britain votes on a referendum next month on whether to exit the EU. Brexit played a role in the election last week of London’s new mayor, Sadiq Khan, who also happens to be London’s first Muslim mayor. Australia’s double-dissolution election — PM Malcolm Turnbull last week announced both the House of Representatives and the Senate would be dissolved and replaced in an election on July 2nd. Turnbull faces replacement depending on which party amasses the most power during the election. There have only been seven double dissolutions since Australia’s federation under its constitution in 1901. Anyhoo…here’s some miscellaneous flotsam that caught my eye in today’s debris field. Number of unique mobile device users: 5 BILLION (Tomi Ahonen) — Do read this blog post, the numbers are mind-boggling. And intelligence agencies want to map and store ALL of the communications generated by these numbers? Browser company Opera just went after iOS market with VPN offering (PC World) — Opera already announced a free VPN to Windows and Linux users; today it targeted Apple users with a VPN for iOS (do note the limited country availability). Don’t feel left out, Android users, you’ll get a VPN offering from Opera soon. Swarm of earthquakes detected at Mount St. Helens (KOMO) — The eight-week-long swarm has been likened to those in 2013 and 2014 due to fault slippage. An eruption may not be imminent. Jihadi Gang Warfare (@thegruq at Medium) — A really good read about the Islamic militant gang in Brussels and how their amateurishness prevented even greater bloodshed in both Paris and Brussels. Unfortunately a primer on how not to do urban terror. Google isn’t just feeding romance novels to its AI to teach it language (Le Monde) — ZOMG, it’s using them to teach it morals, too! That’s what Le Monde reported that Buzzfeed didn’t. Deux chercheurs de Georgia Tech, Mark Riedl et Brent Harrison, vont encore plus loin. Selon eux, la littérature peut inculquer des valeurs morales à des programmes d’intelligence artificielle. « Nous n’avons pas de manuel rassemblant toutes les valeurs d’une culture, mais nous avons des collections d’histoires issues de ces différentes cultures », expliquent-ils dans leur article de recherche publié en février. Two researchers from Georgia Tech, Mark Riedl and Brent Harrison, go even further. They believe literature can inculcate moral values in artificial intelligence programs. “We have no manual containing all the values of a culture, but we have collections of stories from different cultures,” they explain in their research article published in February. Gods help us, I hope they didn’t feed the AI that POS Fifty Shades of freaking Grey. Though I’d rather 90% of romance novels for morals over Lord of the Flies or The Handmaid’s Tale, because romance’s depiction of right and wrong is much more straightforward than in literary fiction, even the very best of it. That’s quite enough trouble to kick off our week, even if it’s not particularly coherent. Catch you tomorrow morning! An earthquake measuring 7.7 on the Richter scale hit southwest Pakistan yesterday. The Balochistan province where the quake struck is isolated and has been plagued by sectarian violence as well as clashes between government forces and local militias. The death toll from a massive earthquake that jolted southwest Pakistan rose to 306 on Wednesday, with officials saying thousands have been left homeless in remote parts of Balochistan province. The 7.7-magnitude quake struck Tuesday afternoon in the province, toppling thousands of mud-built homes as it spread havoc through Awaran and Kech districts and the southwestern parts of the country. Pakistan’s military on Wednesday rushed to reach the scene of the earthquake to launch a relief operation in the affected areas. Officials said the toll was expected to rise as rescue teams reach more villages in the remote area. Provincial home secretary Asad Gilani confirmed 306 people had been killed and more than 400 injured from the huge quake. The scale of the affected territory is daunting. Awaran’s population is scattered over an area of more than 21,000 square kilometres. More than 60,000 people live within 50 kilometres of the epicentre, according to the UN disaster agency, mostly in easily collapsible mud homes. Television footage showed collapsed houses, caved-in roofs and people sitting in the open air outside their homes, the rubble of mud and bricks scattered around them. Abdul Rasheed Baloch, a senior official in the district, said teams had worked through the night to try to retrieve bodies and survivors from the rubble. “Around 90 per cent of houses in the district have been destroyed. Almost all the mud houses have collapsed,” he said. The earthquake hit in the late afternoon local time, so we can hope that many people were able to move out of mud brick structures before they collapsed, but it still would not be surprising for the death toll to continue a rapid climb as more information emerges from remote sites. Mohammad Danish, a marine biologist from Pakistan’s National Institute of Oceanography, said a team of experts had visited the island and found methane gas rising. “Our team found bubbles rising from the surface of the island which caught fire when a match was lit and we forbade our team to start any flame. It is methane gas,” Danish said on a local television news channel. The island is about 60 to 70 feet (18 to 21 metres) high, up to 300 feet wide and up to 120 feet long, he said. It sits about 200 metres away from the coast. Gary Gibson, a seismologist with Australia’s University of Melbourne, said the new island was likely to be a “mud volcano”, created by methane gas forcing material upwards during the violent shaking of the earthquake. “It’s happened before in that area but it’s certainly an unusual event, very rare,” Gibson told AFP, adding that it was “very curious” to see such activity some 400 kilometres from the quake’s epicentre. 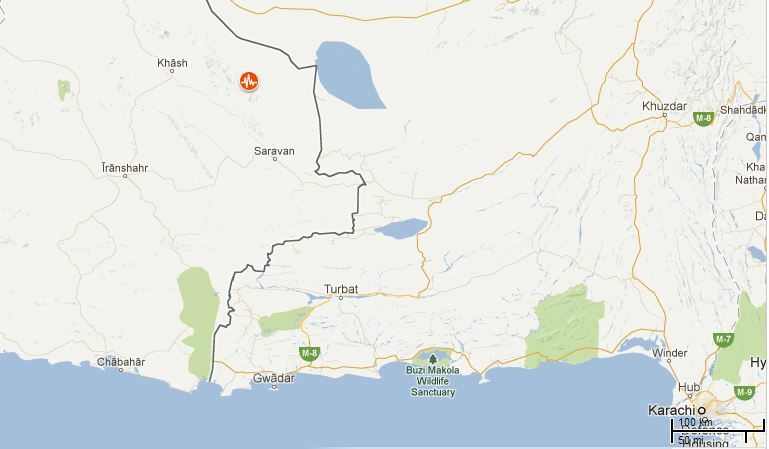 Google Map screen grab of USGS-reported epicenter of earthquake in Iran. A massive earthquake has struck near the Iran-Pakistan border in the region known in both countries as Balochistan. With Iran subject to massive US sanctions that are already crippling its economy and affecting health care, responding to this disaster will be a huge challenge. Just over the border in Pakistan, the region has been torn by what some see as government-sanctioned disappearances and killings. The border in the region is quite porous and there have been a number of incidents involving both Iranian and Pakistani border control agents. The best prospects for the economy of the area to improve hinge on the Iran-Pakistan pipeline which crosses the border within about 150 miles of the epicenter and development of the port of Gwadar, which Pakistan recently signed over to China, also just over 150 miles from where the earthquake struck. At least 40 people have been killed after a powerful earthquake measuring 7.5 on the Richter scale struck Iran’s southeastern Sistan and Baluchestan Province, the Iranian Seismological Center (IRSC) says. The IRSC reported that the epicenter of the quake was situated 81 kilometers north of the city of Saravan. An Iranian government official said he expected hundreds of deaths from the massive 7.8 magnitude earth quake, felt as far away as New Delhi and Gulf cities of Dubai and Bahrain. “It was the biggest earthquake in Iran in 40 years and we are expecting hundreds of dead,” said the official, who spoke on condition of anonymity. Tremors from the earthquake were felt as far away as New Delhi and the Gulf cities of Dubai and Bahrain. Note that last year, two earthquakes in northwest Iran killed over 300 people. Those quakes had magnitudes of 6.4 and 6.2 on the Richter scale. The scale is logarithmic, so even the lower 7.5 estimate from Iran (compared to the initial 7.8 from USGS) makes this earthquake at least ten times more powerful than the quakes last summer. The region where today’s quake struck is much less populated, but with a quake of this magnitude, expect the devastation to cut a very wide swath.